"No Space Final Bloodmatch For my piece, I am turning No Space into a level in the video game Team Fortress 2. Basically, people will deathmatch in the gallery. What it's about is the way video games let us play with space. Photography lets you take a picture of a place, but games are literally making it possible to experience architecture remotely. The video game Doom 1, for instance, was downloaded over 10 million times in two years. The space of Doom has been visited and experienced by over 10 million people, it's one of the few places that has become iconic, a place so experienced that its a common vocabulary. Doom's first level, might be the closet humanity has come to a common room, while the Pyramids of Giza have been visited by tourists before the Greeks decided to vacation there, Doom managed to garner more tourists in its first 6 months on the Internet than visit Rome in one year. What games are becoming are communally experienced spaces, the same way photographs of Nguyen Van Lem's execution became icons of the Vietnam war, levels from Super Mario Brothers represent nostalgia for our youth.. Games represent a new kind of vocabulary that pop culture is only beginning to explore. I want to show not just that games are allowing interactions previously impossible in these places, but that we're coming close to being able to throw around space the way photography throws around sight... and that we can also shoot grenade launchers in our friend's houses." 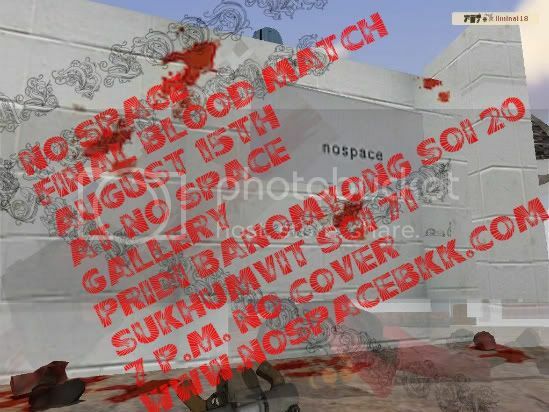 FREE 'NOSPACE FINAL BLOOD MATCH' PC GAME SOFTWARE!! !